Thanks to the advanced technology, you’re now able to play TiVo TV Shows on your Android Tablets& Phones directly. If you don’t know how to get it yet, take this tutorial as reference, which will share two effective ways to help you play TiVo TV shows on Android Devices on the go. Free to download TiVo app from Google Play and Launch it. Sign in with your tivo.com username and password. In home streaming means that you can stream shows to your iPad/iPhone only when you are connected to your home network. Out-of-home streaming means that you can stream shows to your iPad/iPhone even when you are away from your home network. Editor Notes: Android device with non-Intel or AMD chip-set is required and make sure your Android device is running version 4.1 or later. In addition, to use the TiVo Stream, you must have a TiVo DVR with at least four tuners that connects to your home network using either a wired Ethernet or MoCA connection. If you can’t do it, just turn to easy method 2. To convert TiVo TV shows for playing on Android devices, you can free trail Brorsoft Video Converter Ultimate Windows | Mac to do this conversion. It’s not only capable to remove the protection from Tivo shows and convert TiVo to Android device compatible MP4 effortlessly, but also can rip Blu-ray/DVD discs, convert Videos, Video_TS files, ISO/IFO files to all popular SD and HD (3D) video formats like 4K/1080P/720P H.265/H.264 MP4, MOV, MKV, FLV, AVI, 3GP, MPEG and more. 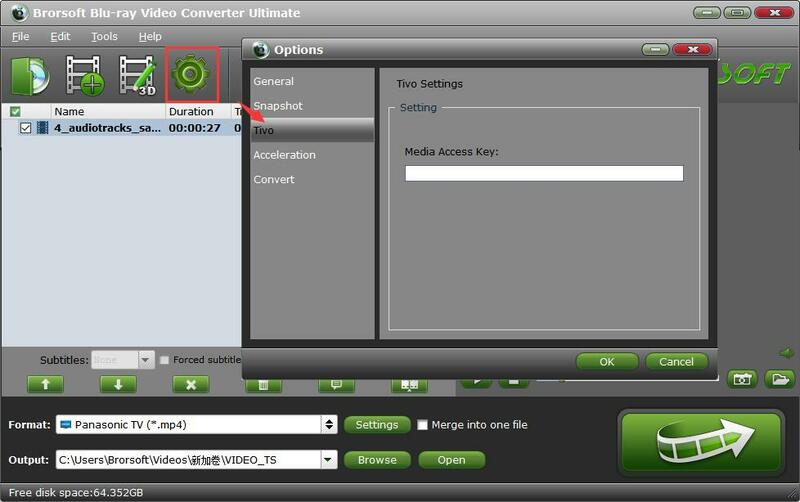 Plus, with the built-in video editing feature of the program, you can trim, crop, add watermark and more to your video files. Launch TiVo Desktop software on your PC. Connect TiVo to your home network, and then the TiVo Desktop will provide you with a list of shows for transferring to your PC. Then please transfer the TiVo videos you want to PC. Once all the shows you selected have been downloaded from your TiVo, they will appear in the Now Playing list in TiVo Desktop. Install and launch the best TiVo to Android Video Converter, simply click “Load Files” to load your TiVo TV shows to the program. Tip: Go to “TiVo Central” menu >> “Messages and Set Up” >> “Account and System Information”, and you will see your Media Access Key there. Click Format bar and go to Common Video list to pick up H.264 Video (*.mp4) for Android devices. With all settings, click “Convert” button to start to convert TiVo TV shows to Android devices compatible MP4 format. Once finished, you can locate the MP4 files in output folder. Then you can transfer this MP4 format TiVo recorded shows on your Android devices for playback as where you like. This entry was posted in Android and tagged convert tivo tv shows for playing on android devices, convert tivo tv shows to mp4, play tivo tv shows on android devices, video converter. Bookmark the permalink.